Renowned for its surfing, camping, swimming, diving and fishing, Medlands beach is situated on the island of Great Barrier. It is situated around 90 kilometres from Auckland. It also offers walking trails with some of the most spectacular views of bush-clad mountains, hot thermal springs, rare native flora and fauna and historic sites. Carry an extra set of clothing with you. Entry to the island in free. However, costs for travelling from and to Auckland, hiring beach sports gear and other expenses apply. Carrying food with you is recommended. Restaurant at the government run lodge. How popular is Medlands Beach? People normally club together Nikau Heights and Parnell Rose Garden while planning their visit to Medlands Beach. 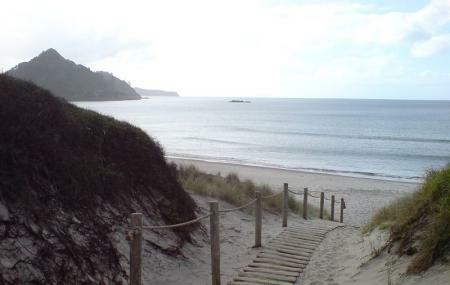 Great hostel than is only a stone away from great barrier island best beach, Medlands beach. I love the back to basics such as the ye olde gas whistle kettle (i want one now) and hob toaster. Malcolm and Robyn made us feel very welcome and the people we meet staying there. A great backpackers. Full equipped kitchen, comfortable beds and friendly managers. A beautiful rural quiet location. Just across the road from amazing Medlands surf beach. Highly recommended. this place was. i would definately stay there again. the host / owner was amazing. very helpfull. took us to the rugby club for dinner. clean tidy place. comfortable beds. awesome views and a short walk to a beautiful beach. not far to tracks. great place. definately stay here. Perfect location, very comfortable and convenient accommodation for family of 4. Comfy beds, friendly and welcoming hosts. Felt like a home away from home. Had a wonderful week staying here. Loved it!